The truth of the matter is, while noisemakers are a fun New Years Eve addition, there is nothing particularly newsworthy about them. Colleen and I decided we were unhappy with this state of affairs. 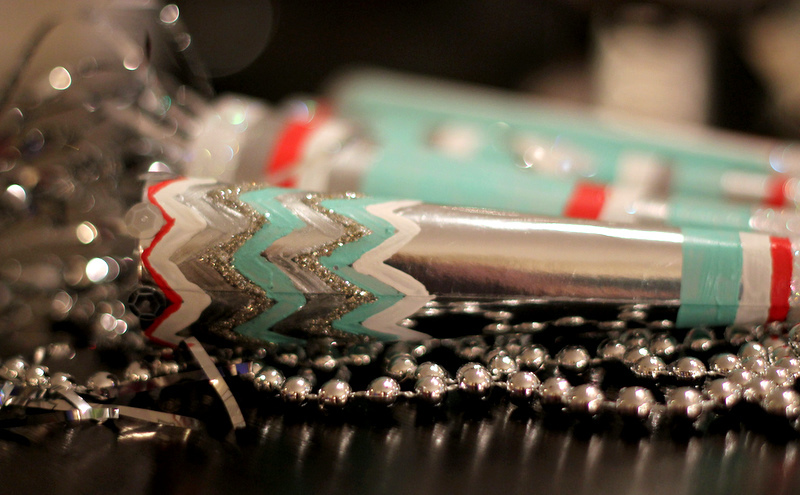 We wanted fancy noisemakers for a fancy New Years. I have to say this was one of the most enjoyable DIYs we have participated in in recent memory. Since we are going bananas and giving ya’ll two DIYs today, I will give you the photos and instructions one at a time so as not to confuse you. 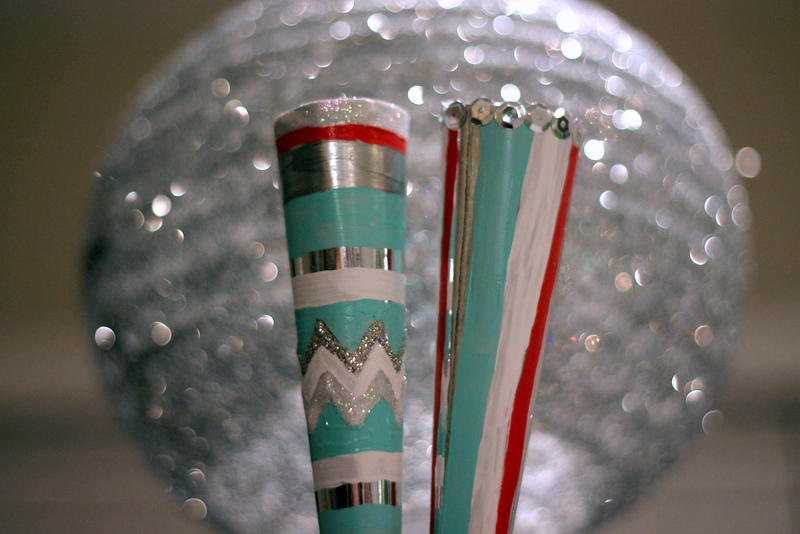 Please keep in mind that you can make your noisemakers look however you would like. You certainly do not have to use all these things. 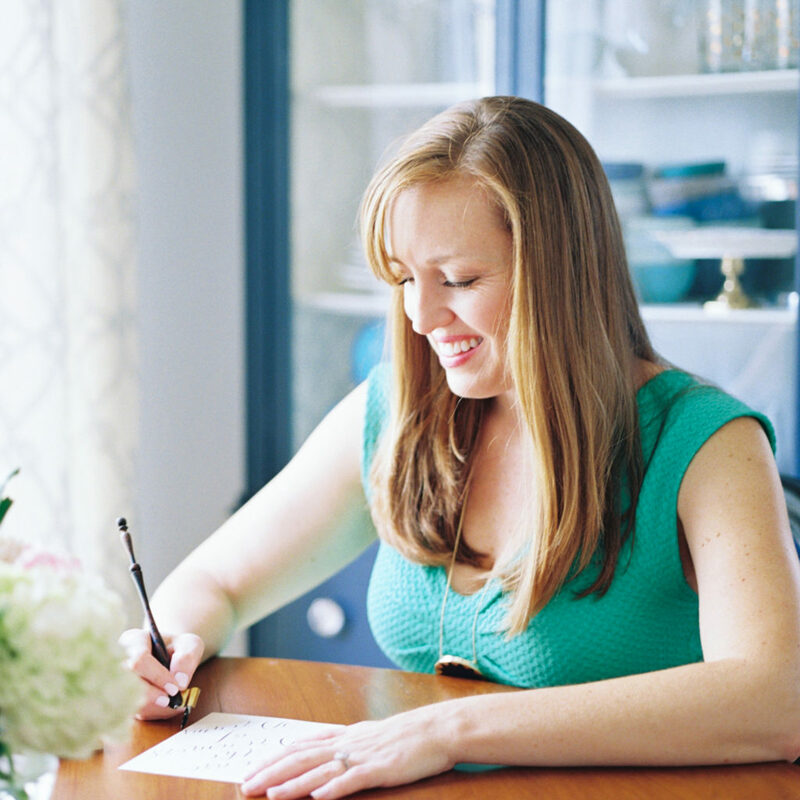 1) Brainstorm a design. It is important that you do this first because it is much easier to apply glitter to any areas you want to be glittery first and foremost. 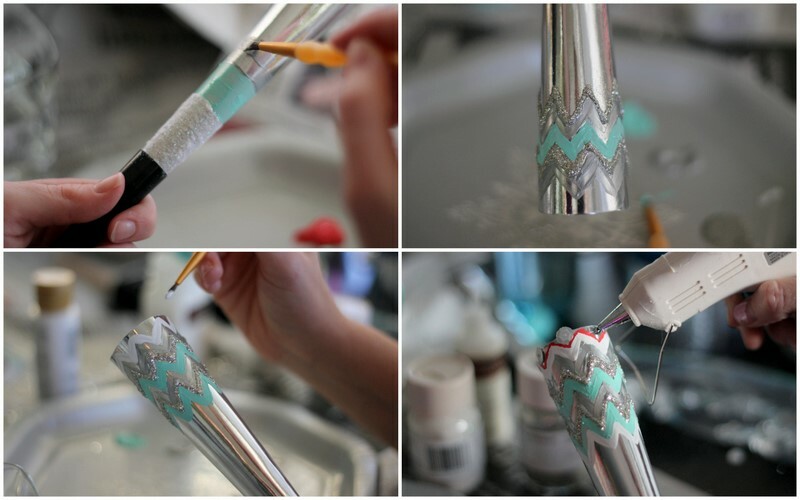 If you apply your glitter last, you are more likely to get it stuck to places with plain paint where you did not plan for it to be. In the grand scheme of things, this is not such a terrible problem to have I suppose. We definitely broke this rule ourselves. 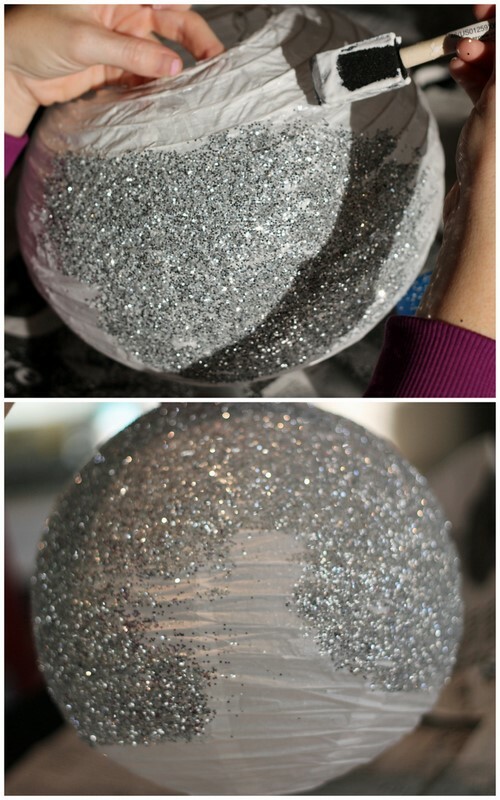 2) As previously stated, apply your glue and glitter first and then go about painting. You may obviously choose any design you like. We went with stripes and chevrons. 3) Lastly, we used a glue gun to apply some sequins and streamers to the inside of the horn for some of the noisemakers. 1) A round white paper lantern. The lanterns we bought were quite small (9″). If you are only doing one lantern, we would suggest a larger one. 1) Paint on your glue in large sections around the lantern. This is easier if you have an extra set of hands to hold the lantern open and taught but can be managed by yourself. 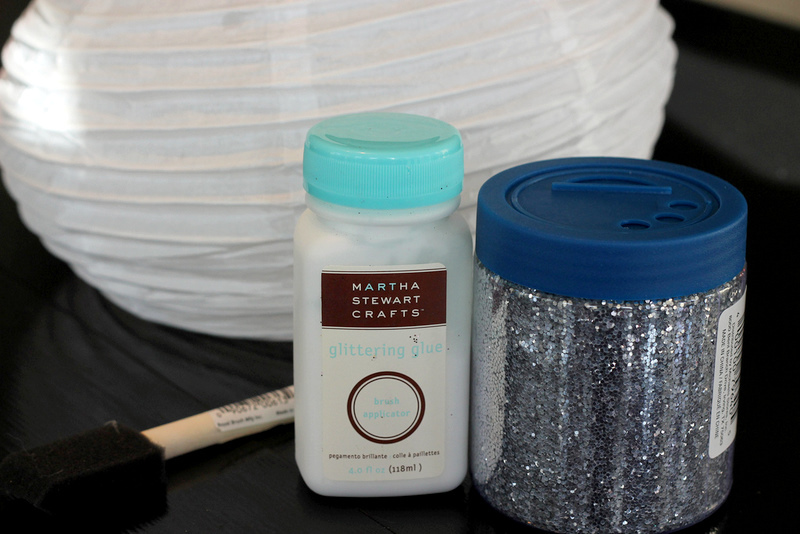 2) Sprinkle on your glitter to the section you have glued. Shake it around. 3) Repeat until the entire lantern is covered. 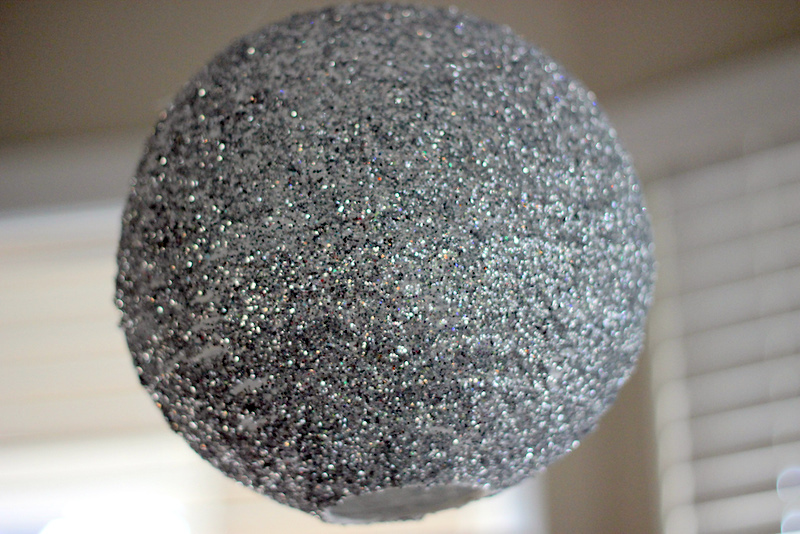 4) Hang to dry and enjoy its glittery beauty. This is the kind of thing that looks different depending on the lighting. Excellent substitute for a disco ball if we don’t say so ourselves. 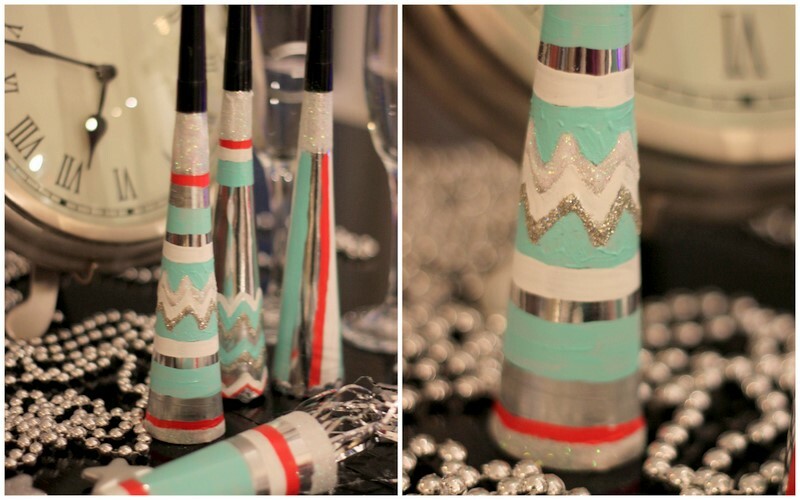 It would really be perfect to use as an easy decoration if you happen to be having a New Years soiree. 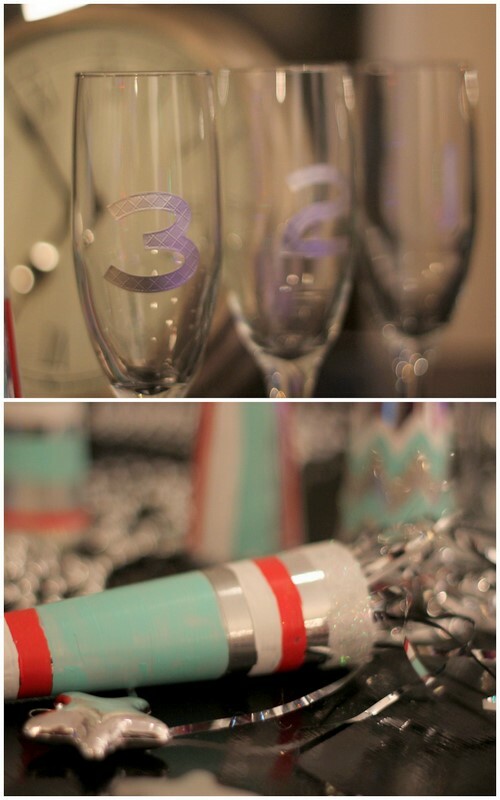 For staging and fanciness purposes, we bought some number stickers to put on Colleen’s champagne flutes for a countdown. 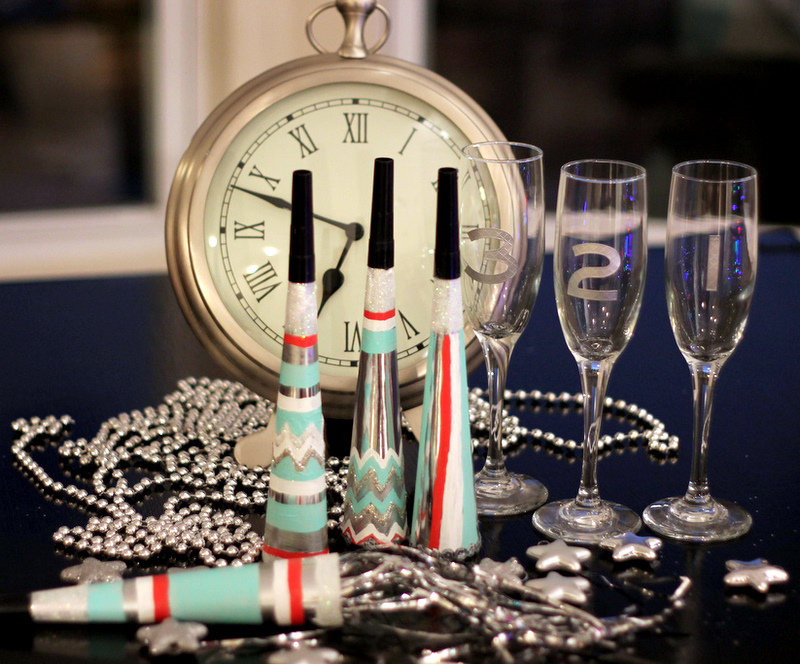 We also used some items we already had including decorations left over from Christmas to create a little New Years vignette to show off our noisemakers. You could certainly use a similar idea for a centerpiece. These look awesome! 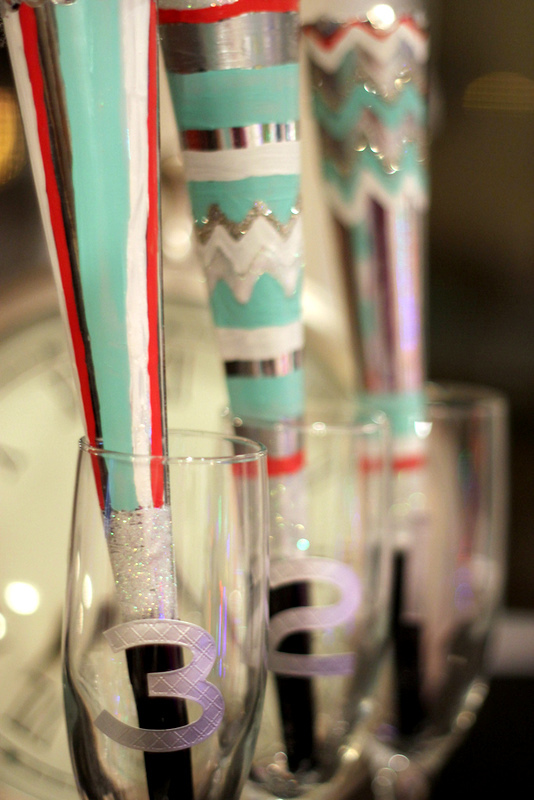 Love the champagne flutes! Fabulous ideas all around! Suddenly I want to host a New Years Eve party! I will be making these for our annual New Year’s trek to the beach! Now if I can keep us oldsters up until midnight that will be great. 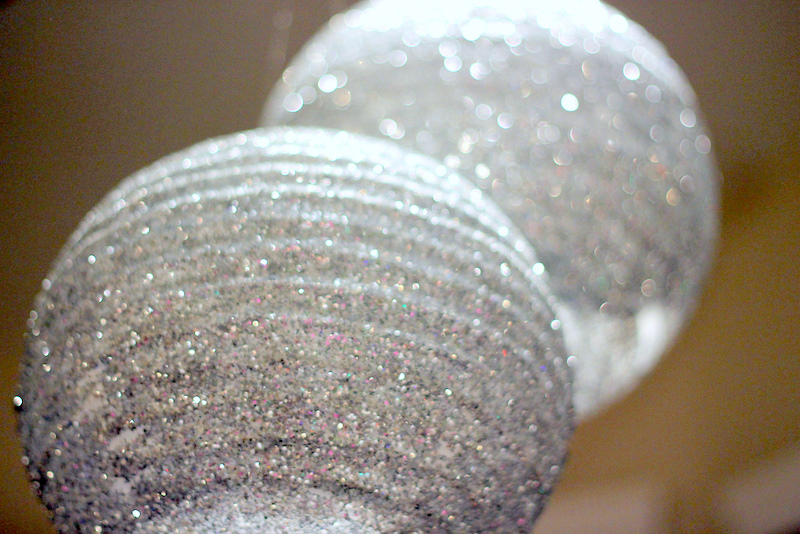 These glitter lanterns are amazing! I am going to try and make them to hang in the tent for my wedding! 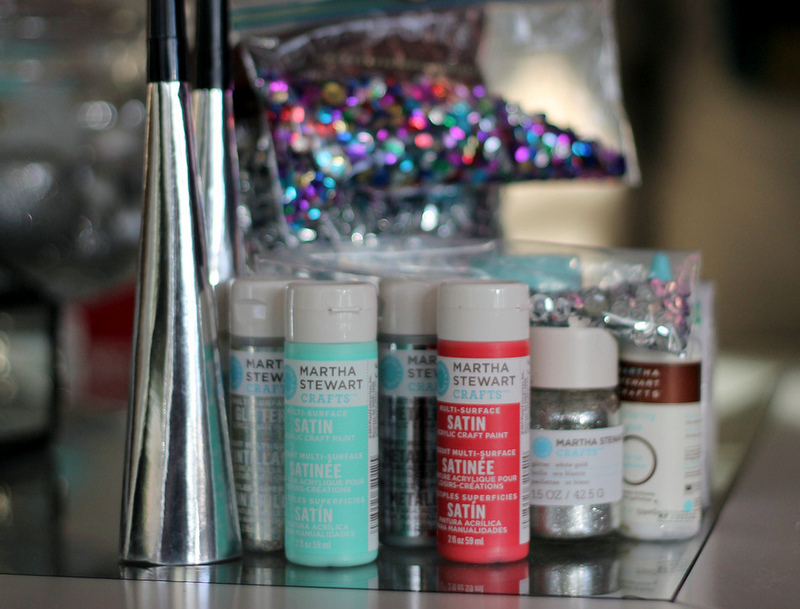 I had a few questions…What brand glitter did you use? And was light able to shine through at all? I am starting to look at ideas for my 40th and was wondering how glitter lanterns would look, then I jumped on Facebook and low and behold someone had posted this tutorial! Perfect, thank you for sharing. Could modge podge glue be used to get the glitter to stick? Just curious. Thanks! hello. can you please tell me if you think these would ship well if they were collapsed and put together again or do you think the glitter would come off? Hi Erica! I think that some of the glitter would stay on but you would definitely lose some as well. It would be a bit risky. 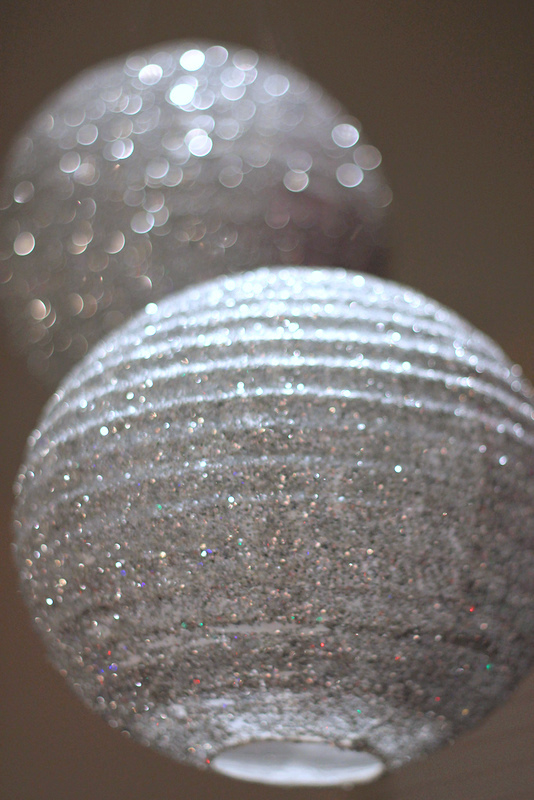 Hi..we are trying to glitter our paper lanterns for a dance…but so far the giltter keeps falling off…did you have that issue with your glitter lanterns? Thanks! The area that I am wanting to hang these lanterns is very dark because of the walls. What type of lights did can I use to put inside the laterns? What do I use to hold the lights inside of the lanterns?